If you are shopping for a new vehicle, you won't find anything similar to the lineup that Volvo is providing this model year. 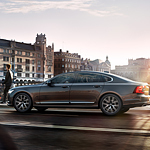 When it comes to the S90, this is a vehicle that you can be comfortable in during your drive to work or on a road trip. This is a vehicle that seats five people in luxury. Volvo is known for their interior materials that provide exceptional comfort. Both the front and rear seat areas will enjoy features like heated seats. If you are interested in cargo space, the backrests in the rear of the S90 have a 60/40 split. The 500-liter load space increases exceptionally when the backrests are folded down. There is also a ton of natural light within the cabin thanks to a moonroof with a automatically-powered sun shade.